The extraordinary healing of a baby inside his mother’s womb has been declared medically “unexplainable” by top Vatican doctors, putting Pope Paul VI one step closer to being declared a saint by the Catholic Church. Seventeen years ago, doctors in California offered a woman abortion as the only possible solution for the abnormality detected in her unborn baby, whom they diagnosed with serious problems that they said would result in severe brain damage, Vatican Insider reports. Instead, the woman chose life, entrusting herself and her baby to God through the intercession of Paul VI, whose papacy ended with his death in 1978. 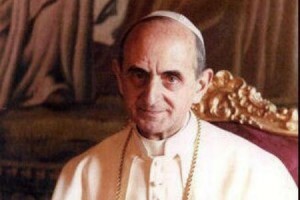 Pope Paul VI, born Giovanni Battista Montini, is most famous for his 1968 watershed document Humanae Vitae that upheld the long-standing Christian teaching against contraception. In the same document he also condemned “willed and procured abortion” for any reason. To the doctors’ amazement, the woman’s baby not only made it to term, but was born without a single one of the predicted health problems. The family was told to wait until their child was 16 – having passed puberty – before a confirmation of complete healing could be given. The child, now 17, is completely healthy. The Medical Commission of the Congregation for the Causes of Saints, chaired by Dr. Patrizio Polisca – Benedict XVI and Francis’ personal doctor – has declared the healing authentic and inexplicable. Benedict XVI approved the “heroic virtue” of Paul VI a year ago on December 20, the first of three steps in the canonical process of declaring someone a saint. Fr. Antonio Marrazzo, C.Ss.R., who heads Paul VI’s cause, told Vatican Radio last year that all the evidence of the baby’s healing in utero points to a “truly extraordinary and supernatural event”. “This healing fits in with Montini’s way of thinking,” he said. LifeSiteNews.com contacted Marrazzo for comment but did not hear back by press time. If the alleged miracle passes the scrutiny of theologians, cardinals, and the pope, then Paul VI will become beatified and recognized as a Blessed. A second miracle is required before he can be canonized (declared a Saint). Paul VI’s beatification is expected within months, reports Vatican Insider.